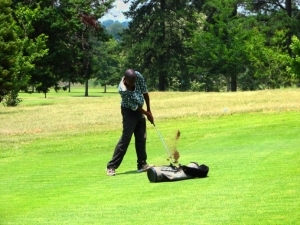 Being in the area, the Corporate Golfer decided to spend an afternoon slashing up White River's immaculate Golf Course. Having hijacked the mother-in-law's clubs - and given that gay marriage has just been legalised in South Africa - he was armed for the occasion with pretty pink clubs. 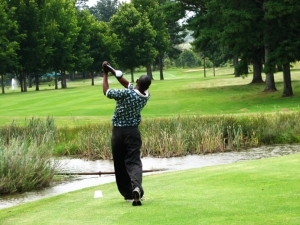 After swinging the arms around a couple of times in a rudimentary warm-up, he headed confidently for the first tee-box, playing man alone, the purist form of golf - just you and the course. Mr Corporate Golfer muscled the tee-shot a full 50m...lower down and to the right where the green-workers on the third hole took cover. After 3 lusty blows, having crossed 2 fairways, and made about 150m of ground on this vicious 450m par 5, the confidence began to wane somewhat...and the anger at the mother-in-law's pink clubs began to rise...by this stage the 2-ball which had started behind the Corporate Golfer had overtaken without noticing him!! Realising the fragilties of his game might soon be exposed, the Corporate Golfer motioned to the 2-ball to continue and play through (not often you see a 2-ball being offered to play through a one-ball!) - being true gentlemen they insisted on playing with the Corporate Golfer. As the first hole progressed from bad to worse, the Corporate Golfer's mood drifted from general unhappiness to to rage at the culprit of his misfortune - the pink clubs. The second hole wasn't anything to write home about either. However the Corporate Golfer's mood ticked up a notch, as he discovered that his playing partners were almost as big duffers as himself. By the third hole the playing partners were lending out their clubs, having taken pity on the Corporate Golfer and his pink clubs. With the benefit of the new clubs and the knowledge of the third hole gained (while playing the first hole!) he managed to shoot a four on the par 3. 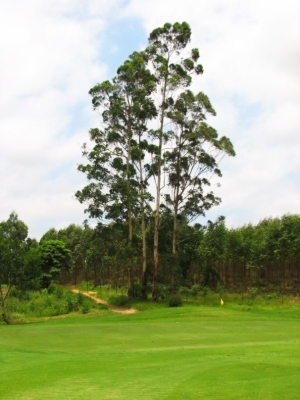 The second par 3 on the front nine was equally kind (or was it the clubs)....however there was not much to be said for the rest of the holes - of course Mpumalanga's sweltering heat was to blame for that (it's more like shoo'ing the heatwave than shoo'ing the breeze there). Hey, if you discount the heat, the pink clubs, having to play alongside a couple of duffers almost as bad as himself, and you add in the generous mulligan he received he practically played level par. Not a bad walk spoiled at all - in fact the Corporate Golfer practically conquered the White River Golf Course.